BLURB: Twelve-year-old Millicent Marie does not like her name. After all, she was named for a woman who died more than fifty years ago and was not the most loveable member of the Harris family. Her friends call her Millie, but when she writes in her diary she refers to herself as Amanda – the name she always wished she had. When Millie’s younger brother finds her diary on her computer, he decides to publish it as a blog for the entire world to see, including the boy Millie has a crush on. In the midst of all the mayhem, Millie/Amanda discovers she is suddenly Springside Elementary’s most sought after sixth-grade mystery gossip and advice columnist. But not all is fun and games, as Millie quickly learns, once she realizes feelings are at stake. Nobody, least of all Millie, expects things to turn out as they do in this tale of friendship and respect. Our Review: Fantastic! This book will keep the attention of your young reader with its great story line that is interesting & fun. Young readers can relate to having parents that 'annoy' them, a sibling that 'drives them nuts', and the ups and downs of friendships. As they are laughing while they are reading they will also be learning valuable lessons in life that start at a young age; such as treating friends/classmates with respect, and realizing things you do may hurt others even when you don't intend it to. This is a fantastic book to read with your child as well, as you can talk to them about these lessons as you go along. 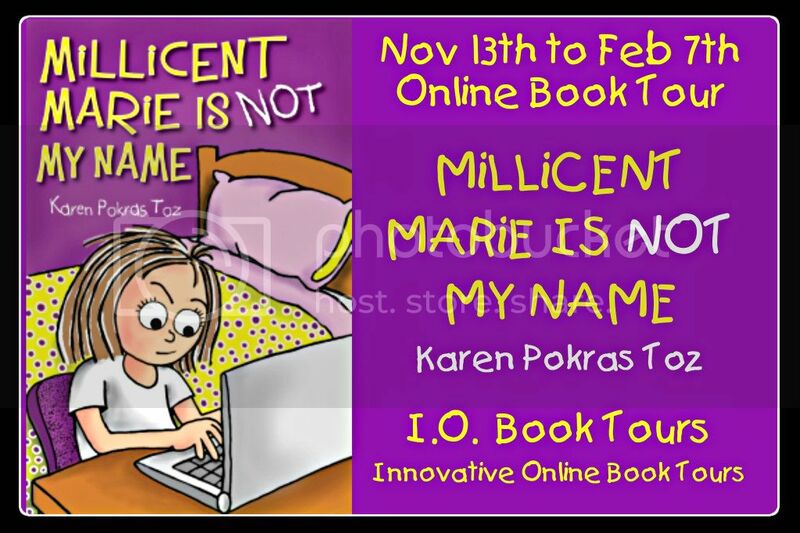 I highly recommend Millicent Marie is NOT my name, by Karen Pokras Toz. BIO: Karen Pokras Toz is a writer, wife and mom. Karen grew up in Connecticut and currently lives outside of Philadelphia with her husband and three children. In June 2011, Karen published her first middle grade children’s novel for 7-12 year olds called Nate Rocks the World, which won First Place for Children’s Chapter Books and the Grand Prize Overall in the 2012 Purple Dragonfly Book Awards, as well as placing first for a Global E-Book Award for Pre-Teen Literature. In 2012, Karen published the second in the Nate Rocks series, Nate Rocks the Boat, followed by middle grade novel, Millicent Marie Is Not My Name. Karen is a member of the Society of Children’s Book Writers & Illustrators (SCBWI). EXCERPT (for a sneak peak, enjoy! ): Carrying the grocery bags in from the garage is one of my least favorite jobs. My mother seems to have this irrational fear that we will some day run out of food and other necessities. So whenever anything goes on sale, she feels as if she has to buy the entire available stock – just in case. Our basement looks like some sort of doomsday shelter with its rows and rows of shelves overflowing with paper towels, bags of pretzels, and canned soup. At least I know I will never go hungry. “Where’s Doogle?” I ask Mom. Why does it seem like my little brother always disappears when there are chores to do? “Douglas is at a friend’s house.” My mom hates it when I call my brother Doogle. I can’t help it. That has been his name since the first day my parents brought him home from the hospital. I was two and a half years old. In two and a half year old speak, Douglas equaled “Doogle.” Ten years later, it still seems to fit him. At least Douglas isn’t as bad as Millicent Marie. The bag of groceries I lift feels like a load of bricks: ten supersized bottles of liquid soap. Well, at least we’ll all be clean. Doogle and I used to get along great. We’d ride our bikes together, play video games against each other, and even make up pranks to pull on Mom and Dad. That was before he turned ten. Now he’s just a royal pest. He wouldn’t be so bad if he would just stay out of my stuff. I’m constantly catching him in my room, and when I ask him what he’s up to he always has an excuse. “Mom sent me up here to get blah blah blah.” Doubt it. I wish I had a lock on my door. After all, I am twelve. A girl needs her privacy you know. “So Millicent Marie, what’s this I hear about you not trying out for the soccer team this year?” Mom asks. “How did you know that?” “I ran into Mrs. Tiller at the grocery store. She said she was talking to Mrs. Nelson who had heard it from Mr. Siegel who was talking with Coach Darden just a few days ago.” “The gossip mill at its finest,” I mumble. “What’s that?” Mom asks. “Nothing. I was thinking of joining the Drama Club instead. They’re doing a musical mishmash of fairy tales and classics called Romeo and Cinderella. “That’s ... different. But I hate to break it you, your singing voice is not the best – and I’m not sure your acting is much better for that matter.” Sigh. Gotta love Mom, always so supportive. “I want to be on the stage crew. You know, help with set design and other backstage stuff.” “But soccer’s your thing. You’ve been playing since you were five years old.” Soccer was my thing, but honestly, after the experience I had at the soccer clinic last week, I had no desire to hang out with any of those girls anymore. It all started when Haylee Tyler, the girl who has for some unknown reason hated me for years, started a rumor about me liking Dan Holt, which was so not true. Now, Jordan Cowell, he’s another story. Jordan is tall and cute and funny and in the Drama Club. Anyway, back to Haylee. So she told everyone on the soccer team that I liked Dan, who by the way, is the geekiest kid in the entire school. So what if I ate lunch with him the other day? To be honest, I felt bad for him. Everyone else is so mean to him all the time. It isn’t his fault he has bad skin and enjoys a good math problem. Besides, we’ve been friends since kindergarten. He’s a nice kid once you get past the dorkdom. Anyway, Natalie - she’s my best friend - wasn’t in school, so I decided to sit with Dan. What’s the big deal? Well apparently Haylee and her sidekicks thought it was funny enough to write “geek lover” in lip-gloss all over my locker. I wound up missing half the clinic cleaning it up. This was not the first time, either. For whatever reason, Haylee Tyler takes great pleasure out of making my life miserable. Normally, I’m able to just brush it off, but this year Haylee announced she was joining the soccer team. My soccer team. Rumor has it that Coach Darden had been trying to get her to play for years. I hate to admit it, but she’s pretty good. Much better than me, and I’ve been playing forever. I’ve heard she’s even up for team captain. Still, it doesn’t mean she gets to treat me that way. “Well, I was thinking I would try something new. Besides, Doogle gets to try different activities, why can’t I?” “Okay, Millicent Marie, I suppose you’re right. It’s good to try different things. Can you do me a favor and put Sparkles’ food in the basement? My back is really acting up today.” “Sure.” “Thanks, Millicent Marie,” Mom says, walking back into the house. Sure, I’ll grab the fifty-pound bag of dog food that our tiny eight pound dog-wanna-be will never even eat because we already have ten other bags of it in the basement. Yup, five hundred and fifty pounds of dog food for one scrawny, little mutt named Sparkles. Doogle named him. Welcome to my family.